Discussion in 'Show Your Collection' started by COOP, Mar 14, 2010. I know that most of the aging on these is sped up by prolonged sealing away inside the bags, so any opened ones are probably relatively fine, but elastics do age fairly easily (the plasticizer that softens them and lends to their elasticity gradually dissipates), and I have seen some reaction - which may or may not be related to this - on the paint of the figure with prolonged contact. @ultrakaiju - Good advice. I picked up an older sealed M1GO where the elastic band had completely melted onto the toy and coated the inside of the bag with a sticky mess. It took me hours to carefully scrape it off the figure, but thankfully, there was no paint damage. Something to consider if the rubber band seems to be "missing" from the photo of a sealed toy. I hope you all know that if you collect 30 of those little coupons you can turn them into M1 for a prize. I just gave Yuji and Michi 60 coupons for 2 premiums. This will be 2 yellow Garamons! Years ago I turned in 30 and got a kanegon in a cocoon! The Moog, chimply.kaiju and deafmetal like this. Ah, that is the set of giants I was asking about. So nice to finally see a preview pic after hearing about these coming in the pipeline. I am completed bonkers for any Gargantuas toys, so these are a definite must track down. I sure hope somehow these come available outside of WF, without the glorious flippers/buying services/resellers taking all the fun out of collecting. I really just want to give Yuji my money, as he deserves it. @chimply.kaiju Oh man, no matter how many times I see the giant T-28, it will continue to impress. I love the new 'classic' blue version, but really, they are all just phenomenal pieces of towering vinyl. 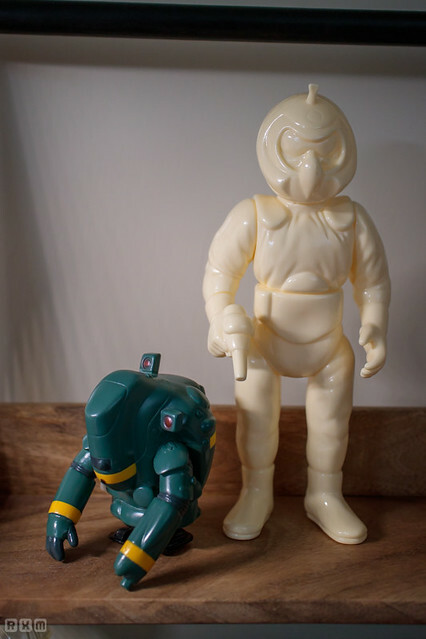 It is great robot/toy/anything to stand proud on a shelf. 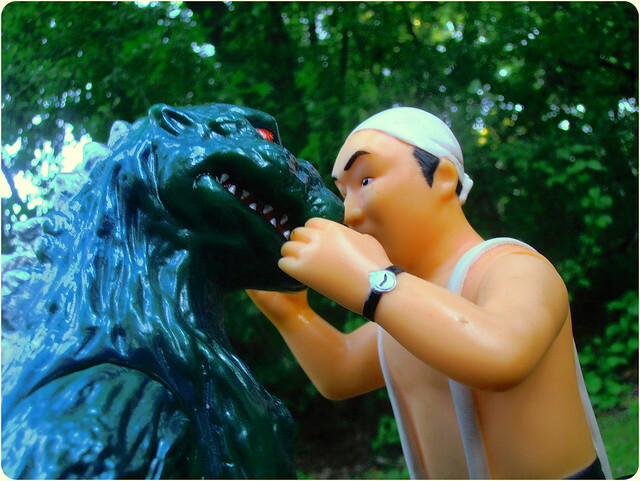 Gojigirl and chimply.kaiju like this. rattanicus, Russblue11, The Moog and 3 others like this. Lots to love there, @deafmetal! Chased mine for years and he was anything but a disappointment when he finally showed up. He's all the more special to me because it was a dear boardie friend that helped me land him. Truly a magic grab, sir - congrats! I still dream of a grayscale version showing up in the world some day, but it is probably best that it never manifests in reality - I'd surely die on first site of a photograph of one. 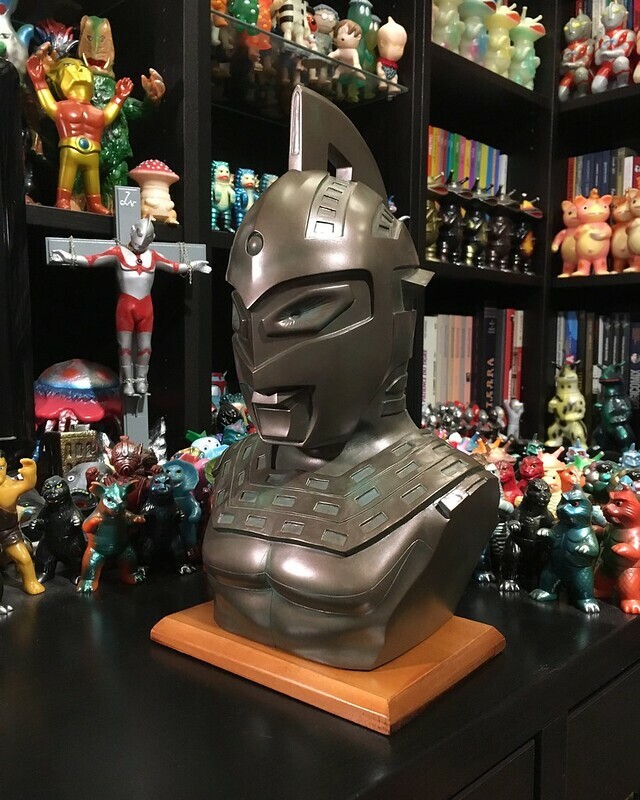 @toothaction - I share your enthusiasm for this one, and it's one of my favorite M1GO sculpts. I would love a grayscale version. That could turn out really well if done right. 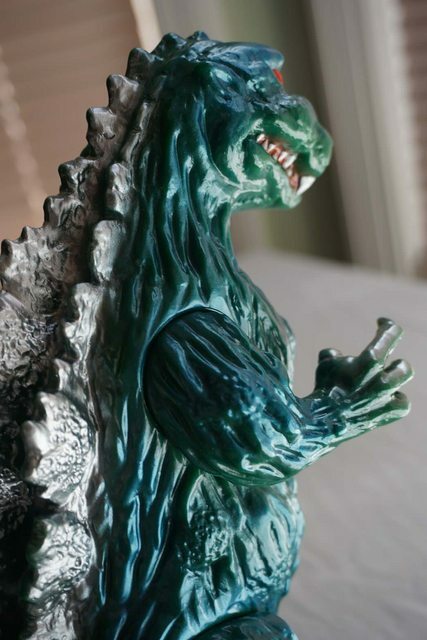 Bad far one of the best Goji sculpt, eluded me for years also as if I remember right it was part of a set with a G Shock watch that I didn't even know was released. A perplexing combo if ever there was one. Not so perplexing to me. As much as I've dreamt of owning the Ultraman G-Shock, that Goji illumination silhouette on this model is mighty fine looking. I wonder how many kaiju resist it is? I do have some sort of appreciation for these watches, but yeah, whenever I see the prices on them, versus what I think they would be, I...well... I just don't really get it. But that's fine, too. Yuji has dead stock and has sold Goji by itself without the watch at shows for a very reasonable price. 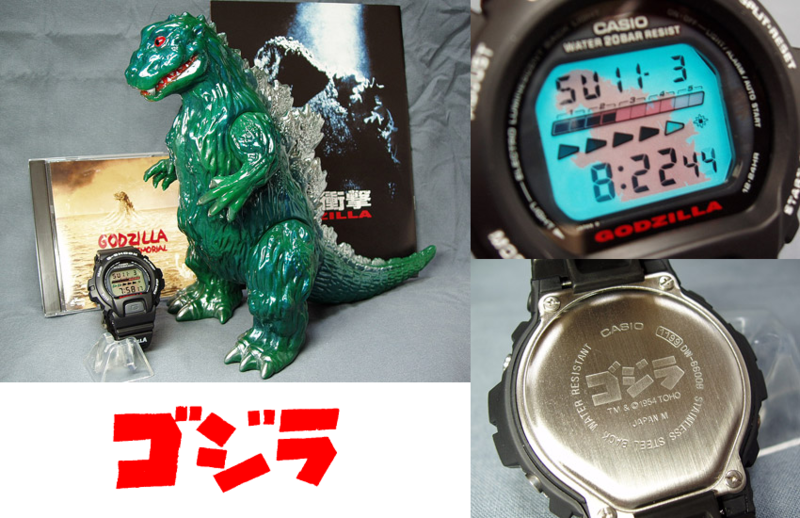 I'm holding out for the Goji/Rolex set. Only the finest things for the gold standard of suit actors! rattanicus, smo9monster and TattooDougHardy like this. the character on this goji!! love it! It's one of my first figures but I still like it a lot, especially how the vinyl feels. rattanicus, xSuicide Squadx, evom and 4 others like this. 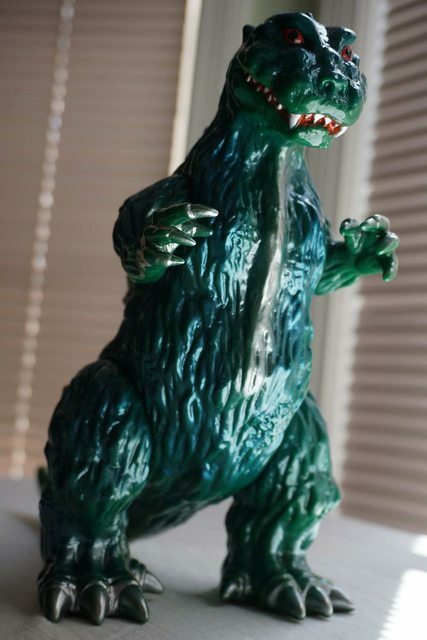 M1go Godzilla 2000 green version. Again one of my first kaiju figures but never take an appropriate photo. xSuicide Squadx, rattanicus and deafmetal like this. @Alebrije - Lovely photos, Roger. I watched Godzilla 2000 again recently, and the M1 sculpt captures the look of the goji really well, and in that classic Yuji-style. Thank you @deafmetal Mark, I recently saw a pair of this Gojis one-off's made by Yuji in a YJP (they were real gems but it's a shame that they went somewhat expensive), if I found the photos I share with you. Didn't know where to throw this. It's an interview Kyle Yount did with Yuji with his wife Michi translating at this past Summer G-Fest. Some great insight. I recommend listening. It's about 42 minutes. Michael Beverage, Gojigirl, doomboy and 2 others like this. EDIT: Kaiju version of the Heisman trophy. boon velvet, Russblue11, Grindingmachete and 10 others like this. smo9monster, Fedhai, Michael Beverage and 13 others like this. Maaan! Deafmetal those are some awesome minis! I’m need to find at least half of them. Big fan of M1 minis! TattooDougHardy, itsa_mia, Gojigirl and 2 others like this. Cross-post. This Mysterian is on Club Tokyo, but without release information. The listing indicated that it is a British Museum version. Anyone konw the story behind this one? Gojigirl and TattooDougHardy like this. Gojigirl, chimply.kaiju, Russblue11 and 5 others like this. I was lucky enough to see one in person, and it is massive and beautiful. Gojigirl and xSuicide Squadx like this.